umami taste - rich, savory, and earthy. Mushrooms are key to making that umami taste, and so we used three types of mushroom - king trumpet, shiitake, and miyatake (button mushrooms). 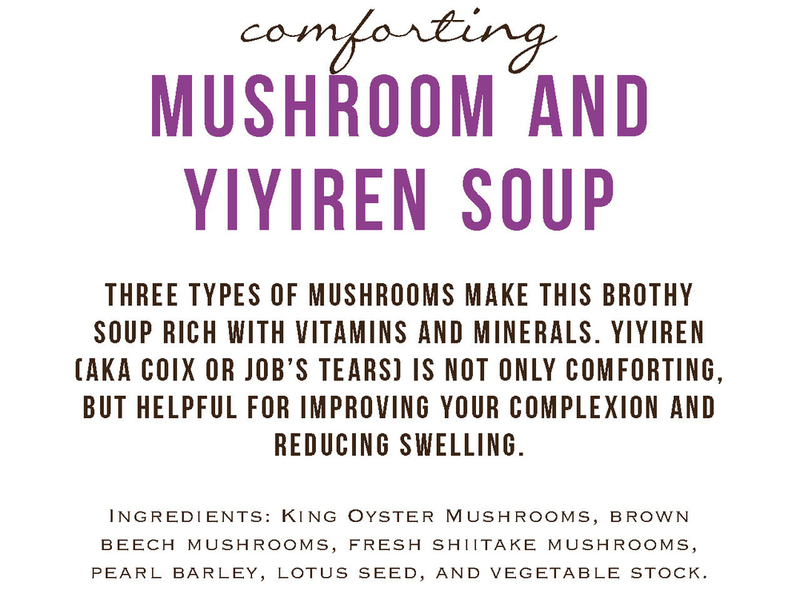 Yiyiren (also known as coix or Job's tears or Chinese pearl barley) is also part of the soup. We've done some research and found that this is a gluten free ingredient even though one of the names for it is barley. It is one of the allowed foods by the NIDDK (National Institute of Diabetes and Digestive and Kidney Diseases). The Chinese herbal medicinal use of yiyiren is to reduce swelling, however the elders do not recommend eating large amounts of yiyiren when pregnant. It is best for any other time when you want to retain less water. 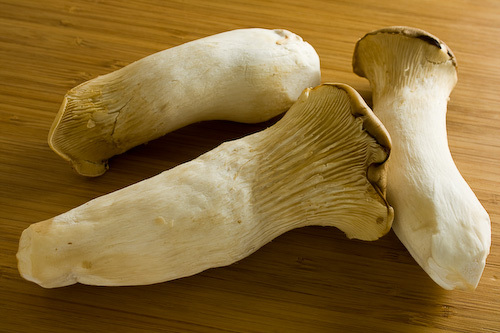 King oyster mushrooms are great for indigestion and often recommended for people with high cholesterol levels or high blood pressure. 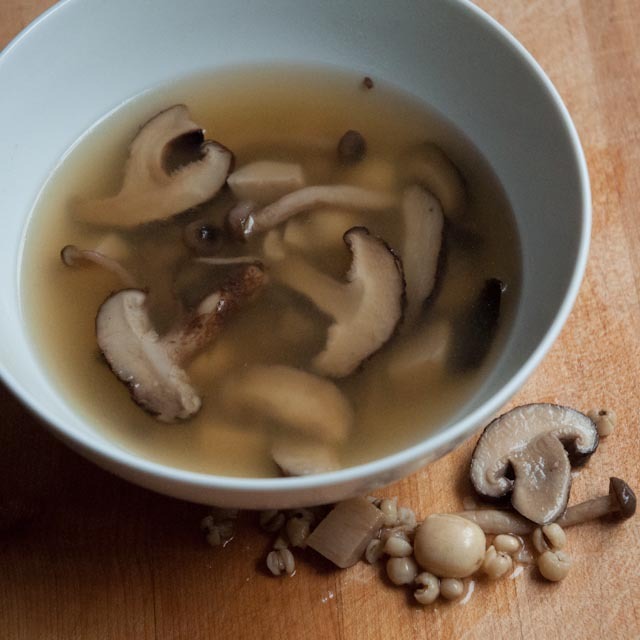 Fresh shiitake mushrooms are also a good non-animal source of iron and protein, magnesium, and vitamin D.
Dried bok choy is one of the harder ingredients to find. It's essential to the flavor of the stock and worth the trip to the Chinese market. This is yiyiren or coix or Job's tears or Chinese pearl barley. It's not really barley. It's gluten free. Here's a spoonful of mushroom and yiyiren soup... with lotus nut! Soak the barley and lotus seed for 4 hours. They can be soaked together. Drain. Meanwhile, combine stock ingredients in a soup pot and bring to a boil. Simmer for 2 hours then strain all the stock ingredients out of the soup. Use a fine mesh strainer to get clear stock. Add barley and lotus to the stock and simmer for 30 minutes. Meanwhile, dice all the mushrooms into small pieces. Toss the mushrooms with some oil. Saute the mushrooms and deglaze with rice wine. Or, broil the mushrooms. Add the mushrooms to the soup and simmer for another 20 minutes. The soup is done when the stock looks cloudy and the pearl barley are soft.